Click on the links below for information! This site is a good place to start. It gives a good picture of a typical pool system. This site has an outstanding on line pool school. Full of information and illustrations. A helpful site on how to backwash. A good site comparing different filters. The only thing we disagree with is what is the "best" type of filter. 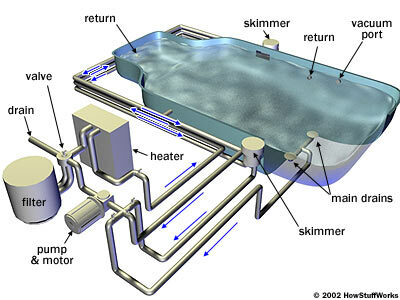 The low cost and ease of maintenance of a sand filter outweigh any disadvantages it may have. A good article about algae. This is a nice article on how to clean your pool. We hope this will be helpful, we will add more sites in the future. Copyright 2009 Apex Pool Service. All rights reserved.